A must for any cabinet! This cabinet vent is perfect for any equipment rack it is self contained, so no tubing or other parts are needed to install it. Simply drill a 3-1/4" hole, mount the vent, connect the power, and enjoy a cooler equipment cabinet. 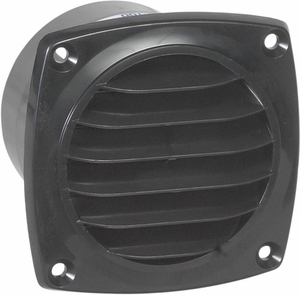 The fan is a brushless levitation fan with a superior bearing system to reduce noise. The fan is reversible to either pull air out or draw air into a cabinet. Adjusting the input power from 9-12 Volts will change the CFM from 8-10. The power supply is included. Available in Black or White.